Nure-egaki yuzen is a form of the traditional Japanese yuzen dyeing technique. What separates nure-egaki from other styles is that in it the pattern is painted while the material is wet, producing are its trademark subtle colors and gradations. 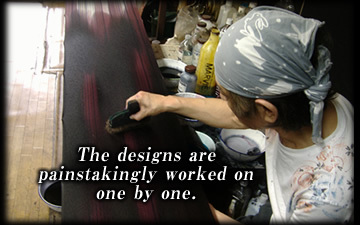 It is one of the musen yuzen dyeing techniques, meaning that the design is painted directly onto the material instead of being marked out with thin lines of glue and dyed in stencil form as is standard. The items from the Ao studio are all hand-painted one by one, so the nuances of the colors are different for every garment produced. The word "yuzen" is mentioned in Ihara Saikaku's "Koushoku Ichidai Otoko," a notable popular novel written around 1680. The dyeing sample book "Genji Hiinagata," published in 1686, references forms of pattern dyeing such as itchi, chaya and edo, and also includes the name "Yuzensai." Yuzensai refers to Miyazaki Yuzensai, a fan painter who, at the time, lived in the Gion area of Kyoto (famous for being the center of geisha culture in Japan). His work was distinguished by his use of existing dyeing techniques to create designs influenced by his fans: the motifs were more free and employed bold use of color. The dyeing style Yuzensai used is considered the origin of the yuzen school of dyeing, and it went on to flourish particularly during the Genroku era (1688-1704). Reasons for its popularity included not just its wide range of colors and the freedom of its designs, but also practical factors such as its color-fastness even when immersed in water, and the way it could be used on any silk without adversely affecting the softness of the material. 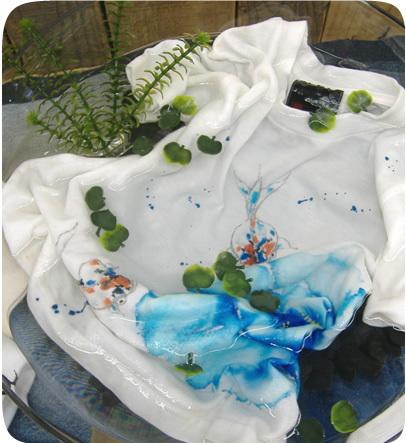 The techniques of yuzen dyeing have been passed down to the present day, along the way being further developed and refined. When the artist has an idea for a design, a series of variations are created on cloth. When a "That's it!" moment occurs, the design is decided. 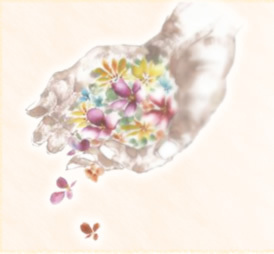 One such artist is Hakusan. He says that one of the pleasures of his art is constantly aiming to create an expression of satisfaction on the face of a customers he may never even meet. Perhaps that is one reason for the superb quality of his work. Producing each design is a long process, but the thought of the eventual happiness it will produce means Hakusan undertakes it with pleasure. Studied under renowned dyer Saizaburou Saitou from the age of 18, then set up his own studio in 1979. Painter of a nure-egaki kimono selected for commendation by the 1968 Kimono Hyakusenkai panel of representatives from the kimono industry. A number of his works have been featured in the magazine Utsukushii Kimono ("Beautiful Kimono," published by Fujingahosha). Exhibits kimono and other textile works. 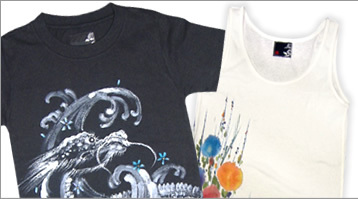 For over 40 years, Hakusan has been producing designs not just on kimono and Japanese garments, but also on non-Japanese garments such as T-shirts and even aloha shirts. 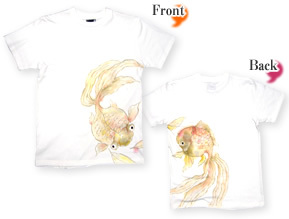 The skill in the designs he hand-paints is immediately obvious. 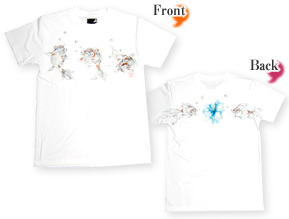 The sizes and colors available vary depending on the item, so check each item's pages for details. Goldfish play (and sing!) by a cool sea flower. A goldfish couple form a circle as they swim together. The pale colors are beautiful in their subtlety. One red goldfish in the middle, and a whole lot of black ones at the edges. You wouldn't see fish at the arms and base if this were a print, and so it proudly states its hand-painted nature to the world! 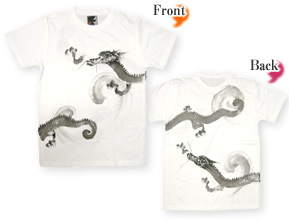 The bodies of these two dragons are each painted with one stroke of the brush. 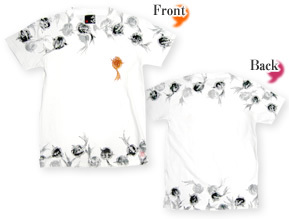 It weaves through the waves, and the spray of the water around it is presented as flowers. 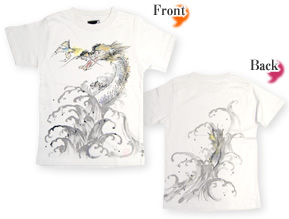 This design is dominated by the large dragon. Painted with real character. 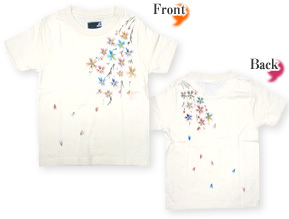 With each flower painted in a different color, this is a beautiful design. 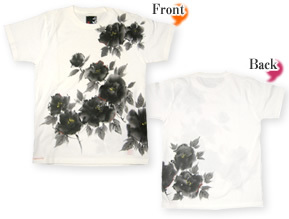 Peonies depicted almost entirely in black, and beautifully complemented by the red stitching. 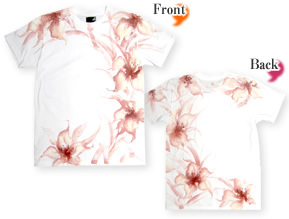 Beautifully ephemeral lily flowers are in bloom all over this garment. Captivatingly abstract in appearance. 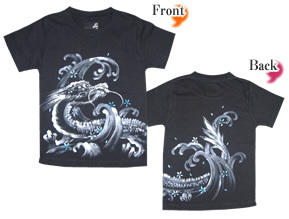 As these items are hand-painted, the designs will differ slightly from those shown in the photos. We have endeavored to use photos that match the actual colors of the garments as closely as possible, but the colors may display differently depending on your monitor and its settings. Please note that we do not accept returns or make exchanges or refunds should the item differ from what was expected, or due to differences in sizes. Refunds and exchanges are made only if the item is defective. These items are processed to prevent fading, but they are vulnerable to friction so wash inside-out. Do not wash with detergents containing fluorescent bleach. Do not wash dark items together with pale or white items. Do not tumble-dry. Garments may shrink. Do not directly iron hand-painted part.